Made by Megahouse Co. of Japan, this wonderful diorama of the Space Alien machine "Mogera" is from the new Toho Science Fiction Movie "Artwork Collection #2" featuring art by legendary Japanese Kaiju Artist Yuji Kaida. 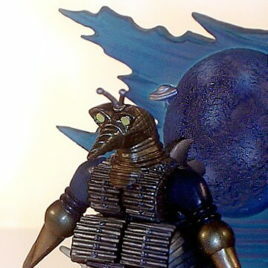 You get two dioramas of Mogera from the movie "the Mysterians" one in color and the other in "Pewter". The detail is just amazing! The dioramas stand approx. 3 inches tall and are made of vinyl. CLAWMARK TOYS WARNING!! Small parts not suitable for very young children. 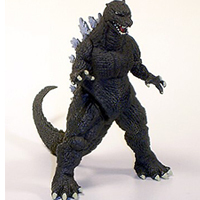 Made by Megahouse Co. of Japan, this wonderful Diorama of Godzilla 1955 is from the new Toho Science Fiction Movie "Artwork Collection # 2" featuring art by legendary Japanese Kaiju Artist Yuji Kaida. 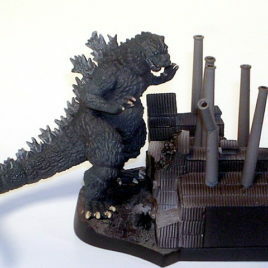 You get two vinyl dioramas of Godzilla 1955 standing in Destroyed Factory, one in color and the other in "Pewter." The detail is just amazing! The dioramas stand approx. 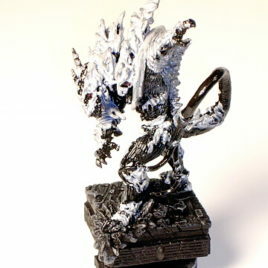 3 inches tall are made of vinyl. . CLAWMARK TOYS WARNING!! Small parts not suitable for very young children. Scroll down for more photos. 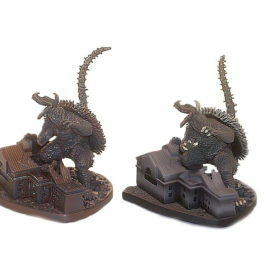 Made by Megahouse Co. of Japan, this wonderful Diorama of Angilas 1955 is from the new Toho Science Fiction Movie "Artwork Collection # 2" featuring art by legendary Japanese Kaiju Artist Yuji Kaida. You get two dioramas of Angilas 1955 standing in a Destroyed Factory, one in color and the other in "Pewter". The detail is just amazing! The dioramas stand approx. 3 inches tall are made of vinyl. CLAWMARK TOYS WARNING!! Small parts not suitable for very young children. Limited supply of dioramas available.